It's a Fourth of July Parade! But it's a little different..... there are no fire trucks or marching bands. Just kids, kids and more kids! 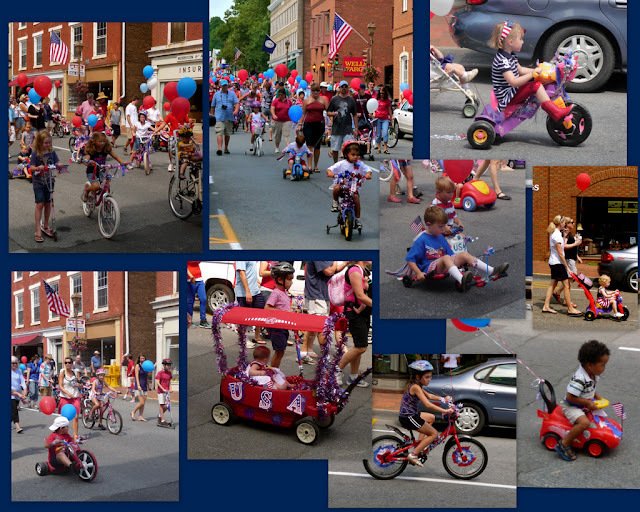 It's the Children's Annual Bike Parade down Main Street. All types of decorated bikes, scooters and strollers! are treated to hot dogs, watermelon and ice cream! We're off to listen to the band and watch the fireworks at VMI! What a perfect parade! Hope you enjoyed!! I love a good parade, nice shots! These scenes reminded me of the July 4th parade here as there are lots of bikes and kids, but ours is much smaller in terms of people. Everyone gets ice pops on the courthouse lawn (no hot dogs or watermelon) and alas no fireworks. Seems like you had a nice celebration. What a wonderful parade! Kids galore; much better than fire trucks and bands! Love your parade and especially Unc. Sam! Every photo is so colorful, well done, Grace! LOVE that last shot .. you've got a very good eye! A Whole Lotta Painting Going On!